Our law firm defends individuals charged with serious crimes in Pennsylvania and New Jersey. While our Pennsylvania practice is normally focused on the defense of individuals in Philadelphia, Montgomery, Bucks, and Chester County, there are situations where we are called upon to defend individuals outside of Southeastern Pennsylvania. Recently, our firm defended a Penn State freshman student charged with robbery, burglary, conspiracy to commit robbery and burglary, and simple assault. The robbery and burglary charges were graded as felonies of the 1st degree and the conspiracy charges were also graded at the level of felony because the person charged with conspiracy faces the same criminal penalty as the principal actor. It is also important to understand that a judge can impose a consecutive sentence if an individual is convicted of a conspiracy charge and as a principal actor. In this particular case, our client faced a maximum penalty of over 80 years in state prison and a fine of over $100,000 if convicted. Our client allegedly entered a Penn State dorm room and participated in the assault of a fellow student. During this assault, the perpetrators allegedly took money and some clothing from the student, which resulted in the robbery and theft charges. Remember that a robbery is any theft by force in Pennsylvania and this is a similar charge in New Jersey. Burglary is the unlawful entry into a person’s residence or home with the intent of committing a crime upon that entry. Robbery and burglary in Pennsylvania can be graded as felonies of the 1st, 2nd, or 3rd degree, depending on the level of the threat. For example, a person is guilty of a 1st degree robbery where he or she threatens or inflicts serious bodily injury but a felony of the 2nd degree if it is simply bodily injury. A person is guilty of a 3rd degree felony, with regards to robbery, if it is any taking by force. Burglary, like robbery, can be graded as a felony of the 1st or 3rd degree. It is a felony of the 1st degree if the property burglarized is a home and a felony of the 3rd degree if it is some other occupied structure other than a home. 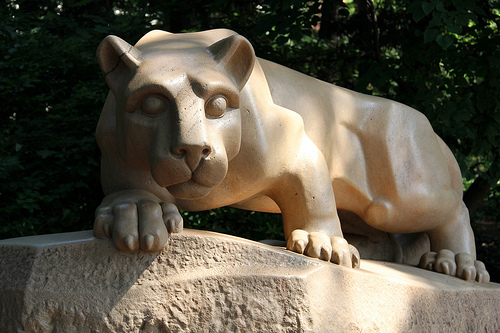 As with any case in Pennsylvania, our client was entitled to a preliminary hearing in Centre County, which is located in State College, Pennsylvania, the home of Penn State University. Keep in mind that a preliminary hearing is not like a trial and I have written articles and done a video on this topic, which I encourage you to read and view. During a preliminary hearing the prosecution must establish a Prima Facia case against the accused individual whereas, at trial, the burden of proof is guilt beyond a reasonable doubt. The burden of proof at a preliminary hearing is much lower than at trial. In this case I was able to successfully convince the judge to dismiss the robbery, burglary, and conspiracy charges against our client at the preliminary hearing level as the prosecutor (Assistant District Attorney) failed to present a Prima Facia case through the witnesses during the course of the 3 hour hearing. While this was a long preliminary hearing, it’s important to keep in mind that the length of the hearing isn’t relevant to a judge’s determination. What is important is whether the defense properly crafts an argument which calls into question the burden of proof in the case. While the prosecution presented long testimony from its witnesses, all of these individuals failed to implicate our client. Our cross examination in this matter was not incredibly long but our argument basically pointed out the inconsistencies and a failure for the prosecution to properly present its case. For more information on preliminary hearings, specifically those involving felony charges, I encourage you to keep reading my blog and visit the free download section.